Room F: As Holmes puts it plainly, "This is a magic-user's room"; he is essentially the "boss monster" of this level. This room is essential to breathing life into the dungeon as it ties together elements from other rooms, including the M-U's tower and the sea caves. "...an evil thaumaturgist (fourth level) who has been trying to take over the dungeon level"
"The thaumaturgist (4th level magic-user) knows six spells..."
The room is described as 50 by 60 feet, which is accurately rendered on the published map. Holmes' original map shows the work bench in the southwest corner and three statues (petrified men), and these are also shown on the published map. However, another door has gone missing in the north wall. This door is shown on the original map and referred to in the text. The charmed fighter originally had 8 "Hits" but this was upped to 11, possibly to make for a more formidable opponent. His other ability scores are unchanged, as is the high value (1000 GP) of his ruby belt. The M-U's list of spells includes "Protection from Good" with the aside "(he is evil)". This was changed to "(he is lawful evil)" to fit the revised 5-point alignment scheme. Note that only "Protection from Evil" is explicitly described in the M-U spell lists in the rulebook. His spells and scroll are otherwise unchanged. Holmes gives the M-U a +1 on this saving throws because "his saving throw is better than that of magic-users of the third level". This doesn't match OD&D, Vol 1, where M-Us do not get a saving throw increase until 6th level. It does go up by 3 at that point, so perhaps Holmes was using some kind of table that smoothed out the progression? This oddity wasn't changed for the published rulebook. The M-U's stats are changed slightly, with his wisdom being decreased from 12 to 9 for reasons unknown, and his "Hits" going up from 7 to 9. The M-Us "wand" is changed to a "special wand", presumably because it is not found on the standard Treasure Table. Finally, the published version adds a new sentence at the end: "He will use the wand on anybody entering his hideway". Since the "hideway" and wand are up in his tower, I picture the M-U dragging statues from the tower down to this room for decoration. One idea I've had is to have one of the statues in this room be Zenopus himself. -NPCs are given a stat block with a full set of ability scores, level and "Hits"
ROOM G: This is the now-standard room filled with trash and giant rats. Is this is its first appearance in a TSR adventure? Holmes had the room written as "Room G - is dark and gloomy". TSR changes this to "Room G - Gloomy", which fits the room's letter code better. "Garbage" might be a better descriptor, given that the floor is covered with rocks and rubbish "four feet high". Once again, the published map is missing a door (in the south wall) shown on the original map and mentioned in the text. I'll have to put together an errata list for these. The big change here is that Holmes' original has but a single giant rat with 1 HD, which Gygax changes to 2-8 giant rats with 2 hit points each. In the published version the text still refers to "its nest", a clue that it originally referred to just a single rat. The change follows the general trend - Holmes' original dungeon was gentler, for smaller groups, and Gygax increased the difficulty of many of the encounters. At the time Holmes wrote this, there wasn't a separate monster entry for a "Giant Rat". Instead they fell under the "Giant Animals and Insects" entry that Holmes included in the manuscript. These creatures don't have set stats except that hit dice generally match the dungeon level, which explains why Holmes gave this rat 1 HD. Gygax deleted the entry for "Giant Animals and Insects", which left these giant rats stranded without any hit dice, though with 2 hit points it's easy to figure out they should attack as under 1 HD. The second edition of the rulebook finally revised the Monster List to include giant rats with 1/2 HD, ported back from the Monster Manual. These also do only 1-3 points of damage per hit, whereas Holmes' original would deal the default 1-6. Still, with an average of 5 rats in the room, the encounter is made more challenging. The treasure is changed in two ways. The silver dagger originally had no value, and Gygax adds "50 gp". (This can be used as a general value for silver daggers, which are missing from the equipment list). In the original, the bag contains 50 gold pieces, which Gygax changes to electrum pieces. Holmes left copper, electrum and platinum out of the manuscript, but Gygax added these back, and put each in the Sample Dungeon. -In Holmes' original version, this provided an example of a "Giant Animal or Insect"
ROOM H: This room introduces an underground river that ties together rooms H, K, L and M. The room is described as 80 by 50 feet with a 50-foot wide river and a 15-foot bank on each side. The map as published has the room the right size, but shows the river as only about 25 feet wide. The text describes a 20-foot ceiling, whereas earlier corridors were stated to be 10 feet high. The staircase into the dungeon is 25 feet high, so either the surface is five feet above this room or the ground above is higher here. This room contains neither monster nor treasure, so its not surprising that there are no changes at all from the manuscript to the published rulebook. -An example of a dangerous obstacle to be surmounted or circumvented. -Some rules for swimming; if you are wearing armor you will sink unless you shed armor which takes 1 turn. Drowning damage is 1 die per turn. Room M later refers back to these as "information on drowning" and says "assume that all characters known how to swim"
ROOM I: This is the room with the bronze sundial and mask. Again, another room without monster or treasure with no changes as published. The talking "bronze mask" resembles a "Brazen Head" of medieval times. 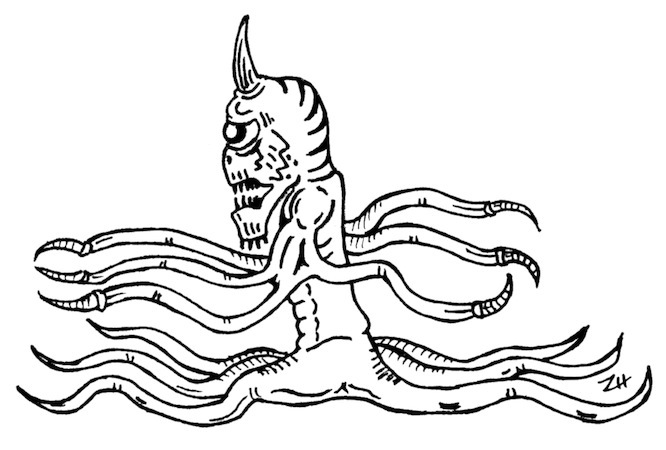 See the Brazen Head of Zenopus. Go Back to Part 47: "The Occupants Are Goblins"
Over on Dragonsfoot, paleologos has proposed an extensive 'campaign sourcebook' to supplement the module B4 The Lost City (1982) by Tom Moldvay. The compilation will include retrospectives, background material and expansions (he did this before for B1, which you can find via this page). He is soliciting authors for various topics; see the proposed table of contents. He is also asking for artwork contributions, which inspired me to sketch the above monstrosity. Furthermore, he's started a thread on Holmes Basic section of the OD&D Discussion board to discuss any possible connections with the Holmes rules. This was one of the earliest B/X modules and there is the possibility that is was originally written for the earlier Basic set, like B3 Palace of the Silver Princess (as confirmed by Frank Mentzer). "To the east of the busy walled city of Greyhawk the land is forsaken, overgrown with thorns and thistles. Oozing marsh creeps slowly down. The copses are huddles of weird, bloated trees. The wiry grass seems to grasp at the feet of any who dare to tread upon it. In the center of this unwholesome place, on a rock-boned prominence, hulks the ruin of the grim Greyhawk Castle..."
"The fallen west gate of Greyhawk Castle was at hand, and through this mouldering portal the party passed. In a few moments they had entered the great central keep, heaved open an inner door, and carefully proceeded down a set of winding stone steps---steps worn with age and slippery with dampness. They had entered the dungeons." "... Old Greyhawk Castle was 13 levels deep. The first level was a simple maze of rooms and corridors..."
"The second level had two unusual items, a nixie pool and a fountain of [endless] snakes. The third featured a torture chamber and many small cells and prison rooms..."
"The fourth was a level of crypts and undead. The fifth was centered around a strange font of black fire and gargoyles. The sixth was a repeating maze with dozens of wild hogs (3 dice) in inconvenient spots, naturally backed up by appropriate numbers of wereboars. The seventh was centered around a circular labyrinth and a street of masses of ogres. The eighth through tenth levels were caves and caverns featuring trolls, giant insects, and a transporter nexus with an evil wizard (with a number of tough associates) guarding it. The eleventh level was the home of the most powerful wizard in the castle. He had balrogs as servants. The remainder of the level was populated by Martian white apes, except the sub-passage system underneath the corridors which was full of poisonous critters with no treasure. Level twelve was filled with dragons. The bottom level, number thirteen, contained an inescapable slide which took the players “clear through to China”, from whence they had to return via “Outdoor Adventure”. Side levels included a barracks with orcs, hobgoblins, and gnolls continually warring with each other, a museum, a huge arena, an underground lake, a giant’s home, and a garden of fungi." Art (uncredited) from Outdoor Geomorphs Set One: Walled City by Gary Gygax (TSR, 1977). The sample encounters from this set reference City of Greyhawk locations, so the art is possibly a picture of the city. Excerpts from The Expedition into the Black Reservoir by Gary Gygax (El Conquistador, 1975). "Bodenburg Castle was used as the original model for the ruined upper works of Greyhawk Castle. Gygax had one in his basement at 330 Center Street" - caption for historical display by Paul Stormberg at Gary Con VI. Photo is by Allan Grohe (grodog). Siege at Bodenburg Map Inset. Source: The Army Men Homepage. Excerpt from "How to Set Up Your Dungeons & Dragons Campaign" by Gary Gygax (Europa #6-8, April 1975) & "'Greyhawk' had a fountain on its second level which issued endless numbers of snakes" (Greyhawk, 1975). Two Levels of the Real Castle Greyhawk by Random Wizard (2013). See also Gygax Castle Greyhawk Map thread at the Knights & Knaves Alehouse. These were maps that Gary was using to run the Castle at conventions in the last decade of his life. Please note that these maps, while appearing old, may not be the original maps for these levels; notably, the first dungeon level of the published Castle Zagyg uses a different map.